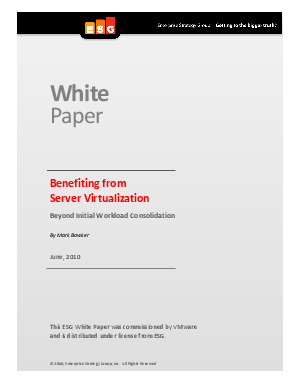 Increasing the use of server virtualization is a top priority for small and midsize businesses. According to ESG's 2010 Spending Intentions Survey, it is nearly tied as the top priority for SMBs over the next 12 to 18 months. There are good reasons for this: virtualization can help reduce costs, simplify management, and improve application availability and disaster protection. It is interesting to note that improving data backup/recovery and managing data growth are also top five priorities-both of which are added benefits of server virtualization.